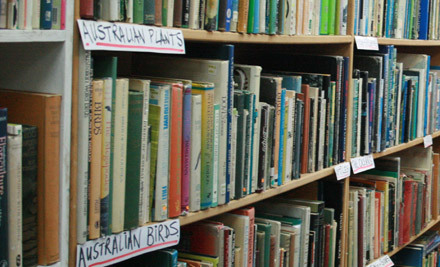 The Book Market is a family run business, buying and selling secondhand books in Glen Innes NSW. The shop, situated in an old bank building in the heritage main street, is stocked with approximately 15,000 books, covering a wide variety of subjects with an emphasis on Australian themes and writers. Father and son team, Badja and Joe Sparks, have hand picked every book, always trying to find interesting, informative and collectable items for their local, inter-state and international customers. In particular we look for Australiana, Ion Idriess, Local Histories, Exploration, The Outback, Aboriginal History and Culture, New Guinea & the South Pacific, Australian Military History, Natural History, Art, Religion, Hunting & Fishing, Farm & Garden, Sport, Antarctic, Railways, Aviation, Ships & the Sea, children’s books especially Biggles & Blyton, as well as Australian & Classic Fiction, collectible crime fiction & Poetry. We also stock old postcards, sheet music, magazines, comics and other interesting ephemera. From Monday to Friday The Book Market is open from about 9am most days, often earlier. We usually close around 5pm, but sometimes if the weather is too wet or too hot or it’s very boring, we close before that. On weekends we usually open Saturday mornings but only open Sunday mornings if there are holidays, a festival or markets. If you are traveling some distance to see us, please contact us. We will always open the shop by arrangement if possible. We are happy to mail books to anywhere in the world. We accept payment by direct deposit to our bank account, Australian cheques, Money Order or PayPal. We do not process credit cards and we don’t have eftpos. Payment in the shop is by cash only. We are always buying good clean books (except encyclopedias and Readers Digest). Badja is usually buying in the shop on Wednesdays, Thursdays, Fridays and Saturday mornings. We will travel to buy old or interesting collections.